Where Oh Where Have My “Sticky Notes” Gone? I recently reinstalled Ubuntu on my laptop. It only took a couple hours to get everything setup and ported over from my old system. I only had one issue, I had some very important sticky notes that I needed to have setup on my new system, and I could not find where they were stored in the home folder. The documentation was worthless, so I just started poking around and found them here…. In order to get the proper screen resolution of 1440×900 on your Intel graphics chipset, you need to install the 915resolution package. 915resolution is a tool to modify the video BIOS of the 800 and 900 series Intel graphics chipsets. This includes the 845G, 855G, and 865G chipsets, as well as 915G, 915GM, and 945G chipsets. This modification is necessary to allow the display of certain graphics resolutions for an Xorg graphics server. Install & reboot and everything will work just fine. You must have the smbfs libraries. They are not installed by default on Ubuntu 7.04 Feisty Fawn. I like to have mine under my home folder. In my case putting the fully qualified domain name did not work (for example daveline.com), the domain name of “dline” did work, so that is what I use. I’ll post later about how to make these mounts permanent. I am testing the limits of QuickBooks, QODBC, & ColdFusion, so I am doing some bulk imports to see what (if anything) breaks or has poor performance. [Macromedia][SequeLink JDBC Driver][ODBC Socket][QODBC] Error parsing complete XML return string. If I try to run the script again, I get the error message again for the first record. I have no know cause for the issues, but I have a quick fix. This is a ghetto hack, but It is working for me. Restarting the service obviously won’t do in a production environment, but it will have to do for now. Got the 10004 with Coldfusion & QODBC? Not exactly sure why this is the case, but I was receiving a 10004 error whenever I had more than one QODBC query during a page request. Not sure if this will cause a problems down the line but I checked “Maintain Connections” option, and everything works just fine. I have used GuitarPro for years, and have absolutely loved it. I have had pretty good success on running GuitarPro on Linux using Wine. I looked a few times, but never found an open source alternative that lived up to my standards. On occasion, I would open up Ubuntu’s Add/Remove Applications and type in the word “guitar” to see what applications were available to assist in me in my musical endeavors. I assumed every Open Source application known to man was available in Ubuntu’s Add/Remove Applications, but I was wrong. I officially have a new favorite Open Source Music Composition Application, TuxGuitar. It provides me nearly everything that I loved about Guitar Pro, but it is actually more intuitive for me to use. And best of all it is free!! There was only one feature that is current missing from TuxGuitar that I would like to see in the near future. GuitarPro has a feature called “scale finder” that allows users to find what scale they are using, based on the score. 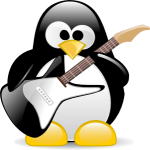 TuxGuitar was painless to download and install with install with the provided Ubuntu Binary Package (.deb). There is one major quirk, TuxGuitar only likes to have one audio item playing at a time. For example I can’t really use YouTube, Rhythmbox, and TuxGuitar at the same time. I am sure it is something simple, but I haven’t bothered to research the issues. So if you have an interest in guitar based music composition on Linux, I highly recommend you check it out! I have been using ColdFusion 8 and CFEclipse for a while now, and have never bothered to get the CF8 syntax dictionaries working. Now that I have the knowledge, and you too can have the power!! I fixed the returns and whitespaces and everything seemed to work.